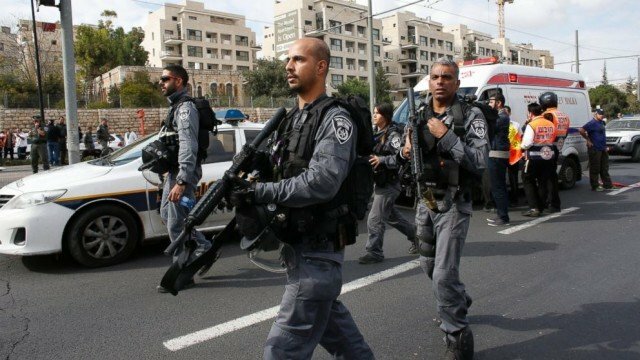 At least one person has been killed after a Palestinian driver has rammed a car into several pedestrians in Jerusalem, hours after clashes erupted at the city’s holiest site. About a dozen people were injured and the driver was shot dead by police. Israel’s PM Benjamin Netanyahu said the attack was “a direct result of incitement” by the Palestinian Authority and Hamas. Meanwhile Jordan has recalled its ambassador to Israel over what it called the “unprecedented Israeli escalation” at holy and sensitive sites in Jerusalem. Also citing continued settlement activity, Jordan is to lodge a formal complaint to the United Nations Security Council in protest, the Jordanian state news agency Petra reported. Israeli media reports say the driver – named as Ibrahim al-Akari – was from Shuafat refugee camp in the east of the city. His Facebook page states that he is a member of Hamas, and the Twitter account for the group’s armed wing, the al-Qassam Brigades, described him as a member and a martyr. Two weeks ago a Palestinian from the Abu Tor area drove his car into a tram station, killing a three-month-old baby and an Ecuadorean woman. East Jerusalem has experienced growing unrest in recent months with Palestinians angry at Israeli settlement expansion on occupied land and restricted access to the al-Aqsa Mosque Compound, known to Jews as the Temple Mount. At times of tension, Israeli police bar male Muslim worshippers under the age of 50 from entering the compound as a security measure. The Temple Mount/al-Haram al-Sharif compound was briefly closed earlier to visitors after dozens of Palestinian protesters fought with police.